The Wolverines came into the GLI as underdogs. Michigan was faced with a tough task in the Great Lakes Invitational semifinal: The Boston College Eagles. The #3 team in the country came into the holiday tournament with a 12-6-0 record on the season, but was the #20 Wolverines who advanced to the GLI Championship with a 4-2 victory. Michigan came out strong. Alex Guptill was robbed early on in the game. Kevin Clare threw a shot wide of the net and it bounced out on the same side of the net. Guptill was all alone, but Billett robbed him with the glove. A few moments later, though, Wohlberg brought it in with Guptill on a two-on-one. He took it himself and lasered one up under the bar to give Michigan a 1-0 lead. BC hit the post on the other end to just miss tying the game. Back-to-back calls on the Eagles gave Michigan a LONG 5-on-3 and they capitalized! Moffie took a shot with Kevin Lynch on the doorstep. The rebound skipped out to Billett's right and Moffatt was right there to bury the rebound. Boston College went to a power play, but it was the Wolverines with the majority of the chances. Wohlberg had a breakaway, tried to go backhand and missed high. Then the Wolverines had a 2-on-1. Travis Lynch shot and Michigan couldn't put in the rebound. Then Kevin Lynch had a breakaway and was stopped. The first period ended with Michigan up 2-0. Early in the second, Treais sprung Glendening on another 2-on-1 and Billett made a nice glove save. Guptill was interfered with while trying to chase his own dump in, but Wohlberg was called for a late hit to even things back up. The momentum really changed at this point in the game. It was all BC for a good chunk of the second period after this. Hunwick made a couple of good stops, Moffatt just missed the far post, and then BC got on the scoreboard. A failed clear by Chiasson led to an opportunity for BC. The player was knocked down by a Wolverine but the puck came back to Tommy Cross at the point. He sent a shot through traffic past Hunwick to make it 2-1. BC just missed tying it shortly thereafter. Kevin Lynch was sent to the box and the Eagles kept buzzing. A little drop pass through the slot got a guy wide open and he hit the goalpost. While still on the power play, Hunwick made an initial stop, but the rebound came right to Carey in the slot who slipped it to Hunwick's right. The Eagles kept up the momentum. A player deked through the Michigan defense and got a shot past Hunwick, but Sinelli and Hyman were in behind the Michigan goalie and Hyman was able to keep the puck out of the net. BC just missed again. All the momentum was on their side and then out of nowhere the Wolverines were back on top. Treais got the puck out of the zone and led a 2-on-1 for Michigan. He shot the puck through Cross's legs and it beat Billett to put Michigan back ahead. That was a big, big goal to put Michigan back ahead in a period where they were thoroughly dominated. The Eagles had a chance to even the score when Pateryn was sent off for kneeing. He cranked Whitney, who was vulnerable after lunging to knock the puck ahead. Their knees hit, but he certainly didn't stick his leg out. I thought it was a really questionable call, but the puck don't lie. Michigan killed it off without too much trouble. PDG was robbed late in the period, and Michigan led 3-2 headed to the second intermission. BC carried the play that period. Hunwick made a really nice stop on Gaudreau early in the third period. Then another early in a Michigan power play, where BC had the two best chances. PDG set up Treais for a good look in front but Billett was there. Pateryn absolutely killed Mullane, and then Chris Brown leveled an Eagle who thought a spin-o-rama in the middle of the ice was a good idea. The Eagles pulled the goalie with 1:15 left in regulation. Their best chance was a bullet from the point that was over top of the net. Glendening had a great effort to get the puck out of the zone, carried it until he got just over center ice, and then paid the price to take a shot at the net. He scored and the Wolverines were off to the championship game with a 4-2 win. That was a huge win for Michigan's tournament chances, in addition to putting them into the GLI Championship Game. Treais was great. In addition to scoring the eventual game-changing goal, he was setting up people all night. He sprung the Wolverines on at least a couple of odd-man rushes. BC gave up a ton of them. I really liked the play of the 4th liners. Moffatt was buzzing for good portions of the game and Hyman and Sinelli both had excellent plays in their own end. They were both in behind Hunwick to save a goal and Hyman had another gorgeous backcheck to break up what would have been a great scoring chance. I'm surprised that Hyman has the worst +/- on the team. Every time I've seen him, he's done good things on the defensive end. The top line was really good, especially in the first period. The second period was rough once Michigan got running around after a couple of penalties, but the first and third were great periods against a really strong opponent. Michigan carried the play for the majority of the game. They had numerous odd-man rushes and breakaways, along with several other chances right in the slot. Billett played really well to keep BC in it, or it could have been much worse. At the other end, Hunwick was good for Michigan and his defense stepped in to help him when he needed it. Michigan will take on FYS in the GLI Championship Game tomorrow night. The Spartans downed Michigan Tech 3-1, though the Techsters outshot them 46-26. Palmisano was strong in net, and apparently Tom Anastos hinted that he might stick with his hot goaltender. Palmisano was really good against Michigan in FYS's shootout win, but the Wolverines have a history of success against him. Should be a fun one! Michigan has another goalie for next year! Steven Racine, the keeper for the Georgetown Raiders of the OJHL, has verbally committed to Michigan. USHR.com first reported that the former Taft goalie had committed, and MHNet confirmed it publicly via some conversations over Twitter. In the three games he's played for Georgetown, he's 3-0-0 with a 1.30 goals against and a .961 save percentage. He pitched a 26-save shutout in his first appearance for the team. He most recently made 48 saves in a 4-3 overtime win. He had previously been with the Westside Warriors in the BCHL, where he was 7-9-0 with a 3.10/.885. After winning seven of his first nine starts this year, the Warriors went into a huge slump. They made a change after he dropped seven straight decisions, though it doesn't sound like he had a lot of help. Prior to the BCHL, he spent quite a bit of time in the USHL and the EJHL. Racine--and I will never say his last name without sounding like Kit from A League of Their Own--is listed at 6'3", 190 and hails from New York. MHNet has a quote from a guy in OHL Central Scouting who called Racine a "good, solid goalie" and "Athletic, but nothing flashy". He is expected to backup Jared Rutledge. He sounds like a solid enough pickup. He's a little bit older, he's got some experience playing in a variety of leagues, and he's got good size. 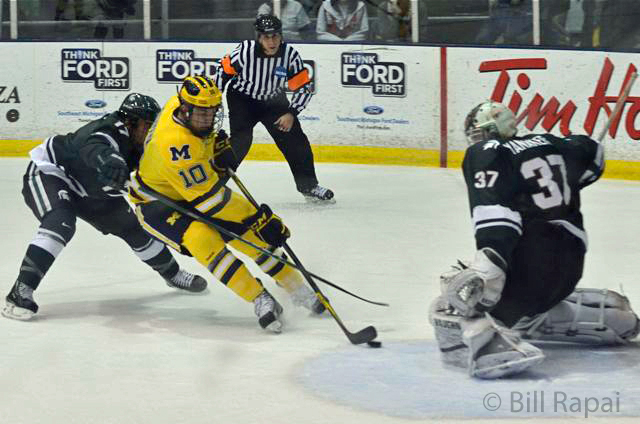 The Wolverines and Spartans face-off in a home-and-home this weekend. Tonight's game is at Yost. Tomorrow they'll play at the Munn Memorial Library. The best part is that *gasp* both games are on TV! Tonight's game airs on FSN Detroit and tomorrow is on the Big Ten Network. Also, the premiere of the Blue Ice documentary airs following the game tonight. The Spartans got off to a bit of a rough start under first-year head coach Tom Anastos, going 2-4 out of the gate. Since then, they've gone 8-1-1, including a win and a tie against Minnesota and a road sweep of Western Michigan. The offense has come alive for them. In the past ten games, they've been held below three goals on just one occasion and have only scored fewer than four twice. They've also been really strong on defense, giving up more than two goals just twice (both to Minnesota, neither of which they lost). It's a good start for The Commish, and I'll eat some crow over that one if they keep it up since I made fun of that hiring an awful lot. They're led offensively by a pair of sophomores, Lee Reimer (7-13--20) and Greg Wolfe (5-11--16). Mike Merrifield, in 12 games, has exceeded his goal and point totals for the rest of his career combined. He had 6-6--12 in 60 games. This year he has 8-5--13 in 12 games. Captain Torey Krug has also chipped in with 11 points from the blueline. In net, ANN ARBOR NATIVE Drew Palmisano and Will Yanakeff have split the duties. Palmisano is 4-3-1 in his eight starts with a 2.73/.910. Yanakeff is 6-2-0 with a 2.26/.923. The starts haven't been a direct split. Palmisano played both games against Minnesota while Yanakeff played both games against WMU and NMU. Yanakeff was 2-0 against Michigan last year (making 37 and 31 saves and giving up 4 goals total). Palmisano gave up 9 on 69 shots last year. Gut feeling, I'd expect to see Yanakeff. The Spartan power play is just 15.9% (38th), but they're 4th-nationally with an 89.2% success rate on the PK. They've also given up 19 fewer power play chances than Michigan. The Only Colors has a preview from the FYS side. After the losing skid reached five and the unbeaten streak reached seven with a 4-3 loss to Alaska on Friday night, the Wolverines were finally back in the win column on Saturday. Alex Guptill scored less than a minute into the extra session to give the Wolverines a 1-0 win. On Friday night, PDG gave the Wolverines a 1-0 lead 2:47 into the contest. Alaska would tie the game in the middle of the first period just after a power play ended, and Michael Quinn and Colton Beck scored 7 seconds apart in the middle frame to give Alaska a 3-1 lead. Moffie cut it back to one just over a minute later. Beck scored again 5 minutes into the third. David Wohlberg cut it back to one with about nine minutes left to play, but despite a 17-5 shot advantage in the third, Michigan was unable to capitalize again. Serville had maybe the best game of his Michigan career statistically, with 2 assists and a +3 rating. PDG had 1-1--2 and was +2. Greg Pateryn blocked 6 shots on the night. The loss dropped Michigan to 10th place in the CCHA. The next night, the Wolverines seemed to be in danger of seeing their winless streak extend to 8. After 60 minutes of play, the score remained 0-0. Guptill scored unassisted on a deflected shot just 57 seconds into the extra frame to give Michigan a much-needed win. That was Guptill's team-high sixth shot on goal of the night. Shawn Hunwick made 25 stops in the victory. The Wolverines were unable to solve Scott Greenham on their first 41 shots of the night, but #42 was the winner. The power play was scoreless on 8 attempts on the weekend (including a 5-on-3 that lasted an entire two minutes on Saturday), but the PK was perfect on 8 Alaska attempts and killed off a Brennan Serville boarding penalty late in the third of the scoreless contest). The win pulled Michigan back into a tie with Miami for eighth place in the CCHA. They are only five points out of 4th, however. All the teams in the CCHA have played the same number of games, with the exception of FYS who has two games in hand on the field (and currently sits 3 points ahead of Michigan). FYS is the next opponent on the slate. The teams will play at Yost on Friday night (on Fox Sports Detroit) before heading to East Lansing is a whore for Saturday's game, which will air on the Big Ten Network, who finally decided to stop being useless from a hockey perspective. The Wolverines will have to do it on Saturday night without PDG, who will be attending Canada's World Junior Championships tryout camp. Several familiar names were on the 29-man list of Team USA's preliminary roster, which will be later cut to 22: Jon Merrill and Jacob Trouba (who is listed as Jake) made the list. It appears the USA goaltending duo will be former Wolverine commits. Both Jack Campbell and John Gibson are on the roster with Andy Iles listed as the emergency goalie. In other news, according to the official Twitter account of the Hamilton Red Wings, commit Spencer Hyman was named to the OJHL All-Star Team. Hyman has 2-10--12 in 17 games this year.